Update: source code of this project is available at CodePlex. Please visit MVC Time Planner page for further information and downloads. Download these components and include them to your ASP.NET MVC project. 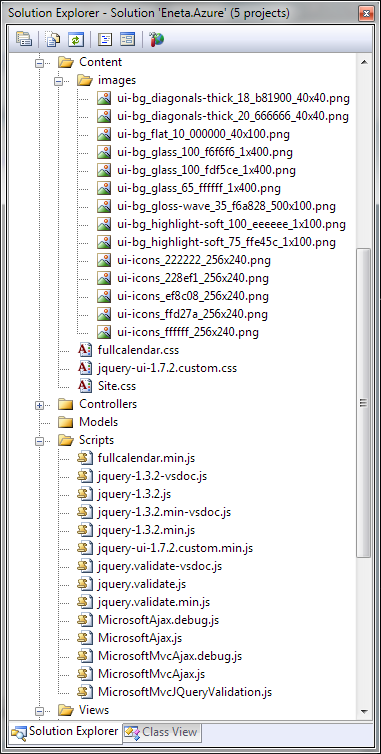 If you have problems then take a look at the image on right – you can what files I included and where they are located. Click on the image to see it at full size. As a next thing let’s include script and styles we need to make calendar work. Because my sample application offers currently no more functionality I included these scripts to my master page. Url.Content method creates correct URL-s and it is way better than MS strategy (href like ..\..\Content\Site.css). 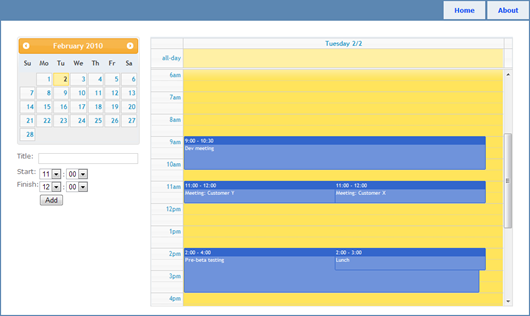 Now let’s use jQuery to make calendar look like calendar. Now paste the following script to page header between <script> and </script> tags. 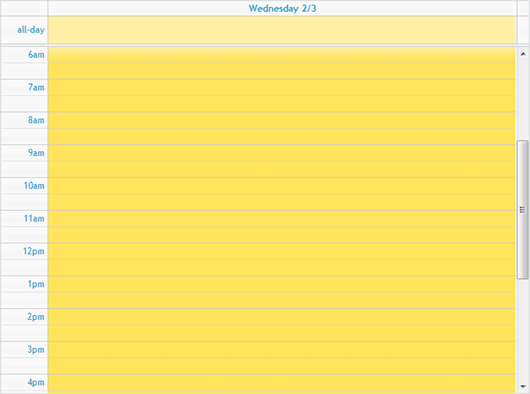 Now you should see calendar like this when you run your application and move to the page where you added FullCalendar. If you look at calendar definition of calendar you can see that there is attribute called events (currently it has value "Calendar/GetEvents/"). FullCalendar uses this URL to get data about event sin selected view. Let’s take a look request to this URL in FireBug. We can see that this request contains three parts: start and end time of current view and one additional parameter that avoids browsers caching the response. Also we can see that start and end times are given as timestamps from Epoch. Let’s see the controller action that returns events for us. ConvertFromUnixTimestamp method is borrowed from CodeClimber blog posting Convert a Unix timestamp to a .NET DateTime. So, let’s say thanks to Simone Chiaretta. If there were no problems and we inserted some events to database then we should see something like this. Pretty nice? As a quick update you can follow my previous posting about FullCalendar Linking jQueryUI DatePicker and FullCalendar and link you calendar to jQueryUI DatePicker. The result is here. can you download your copy ready? I do not get the point :(. I skipped the MVC :-). How can I build without MVC? Can this be setup to connect to/pull from Outlook ? Timo, you can use basically same code also for ASP.NET Forms. You just have to create JSON responses and write them out. After that you should immediately close response to avoid another mark-up. Also you should set correct content type. It is all pretty simple. Steve, it is usual web application and it is not able to communicate with Outlook that runs on your desktop. You can extend it to add support for vCal or iCal downloads. Outlook can detect those files and add events to your calendar. I don't have ASP.NET forms example. I have ASP.NET MVC version only. If it is okay for you I can send it to you. If you want forms example then you must wait some days as I am pretty busy right now. Please send me a message with your e-mail address and I will send you the example like it is right now. ok thanks. I sent you an e-mail! I too would be interested in seeing this sample code if possible...dave -at- thehorners.com. Thanks!!! Can you please send me an example for asp.net via email too at yhrchan@hotmail.com? Awesome post - you saved me a lot of time. Thanks a lot!!! Can you send me the sample code please. Can you send me the sample code please? Thanks for producing such great code! I would also like a copy of the code if possible. do you have any story about how to integrate with wdCalendar? I guess I'm the only one having this problem but this technique doesn't show any events for me. I think it's because DateTime.ToString("s") gives a string of the format:"2011-04-10T17:00:00"... The T seems to be the problem... Anyone got a solution for this? 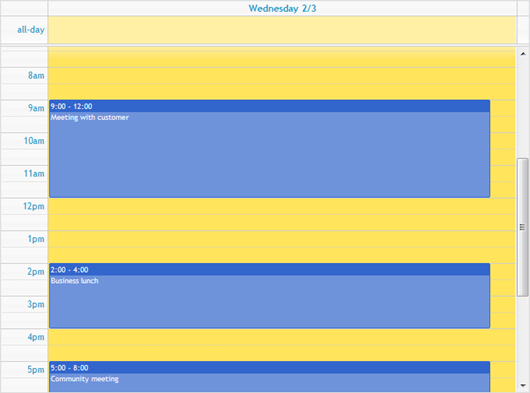 Is it possible to synchronize my fullcalendar with a google calendar? What about downloading the calendar as an excel file, pdf or word? IEventRepository is my own interface defined my own code. Json is method of controller class. Very cool, extremely useful and simple to implement. Thank you. I want to customize the JSON call for event. Were you able to update the control to month/week views? just curious. Can this script be used with ASP.NET MVC3 RAZOR..?? Please help. If not, can you give any calender script that can work with ASP.NET MVC3 RAZOR. thnk u for the tutoriel! should i import an additionnal assembly ?